When I was creating the prompts for Fishbowl Friday... I might have gone a little bit overboard with the possibilities for glitter manicures. I snorted when I opened up this prompt, because I didn't even remember creating it. Part of me wishes that I had a mermaid stamping plate so I could properly give this sparkly ocean on my nails the send-up it deserves. Aaaand the other part of me likes it just the way it is. Then there's that tiny little part of me that just wants to add even more glittery goodness to the fray. There's a lot of sparkle going on here. I started out with the holographic deep teal that is Up & Cunning by KBShimmer. It was opaque in two coats and went on like butter. I'm really falling for the formula and the brush on KBShimmer polishes. From there, I added a coat of Zoya Muse, a recent acquisition during the Free4You promotion. Muse is described as a "blue raspberry holographic fizz with a subtle vein of gold." I love the gold shimmer in this shade. Mixing with the blue, it really lends itself to the whole oceanic vibe. I actually chose this polish after seeing it in a few gorgeous mermaid manicures! Pahlish Gumdrop Rooftop added a nice mix of flakies and iridescent glitter. The flash from gold to orange to red to fuchsia adds a nice variation to the cooler, opalescent glitters in Muse and Moonlight the Night. 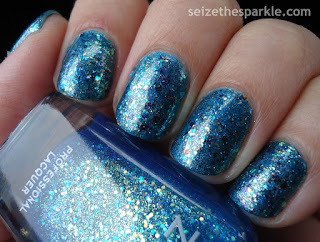 China Glaze Moonlight the Night features larger opalescent glitter in orange, mint green, bluish-purple, and turquoise. I feel like it's similar to Fingerpaints Daubigney's Garden, but I haven't swatched them side by side. Let me know in the comments if you'd be interested in seeing them. I think Moonlight the Night is in a more translucent base, but I can't say for sure. The shade was a great middle for my glitter layering, and I love the darker bluish-purple the most. After Moonlight the Night, I added another coat of Gumdrop Rooftop, followed by a coat of Zoya Muse to bring everything back to a nice bluish-teal tinge. 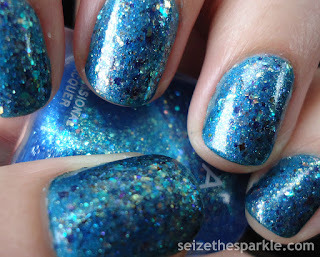 Muse is an amazing polish, definitely the blue sister of Zoya Binx. 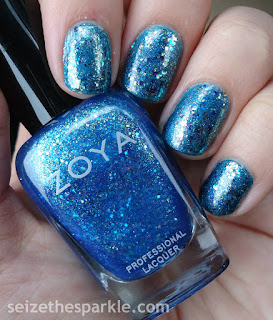 I really wish Zoya would make these kinds of glitter polishes in all of the colors, maybe with a few contrasting shimmers! Thankfully, nothing about this layering was particularly bumpy or gritty. So, I finished it off like I usually do, one coat of SinfulColors clear coat followed by Seche Vite. And good to go! I'm always thankful when Friday comes around, and today isn't any different. It's been a busy week with a lot going on, and then on top of that, we'll be getting a bunch of snow tonight! That pretty much guarantees some snowman building and sledding action tomorrow. And probably a whoooooole lot of "Do you wanna build a snowmaaaaan?" Let it snow, let it snow! I salute you on this epic, glittery layering! Just love it!!! I too suspect that China Glaze looks like that Fingerpaints one that I have, so I would love a comparison post! Thanks Arathael! I have both bottles out on my nail table for a comparison later tonight!! !